Slow Cooker 16 Bean Country Soup - absolutely DELICIOUS!!! Just dump everything in the slow cooker and let it work its magic! 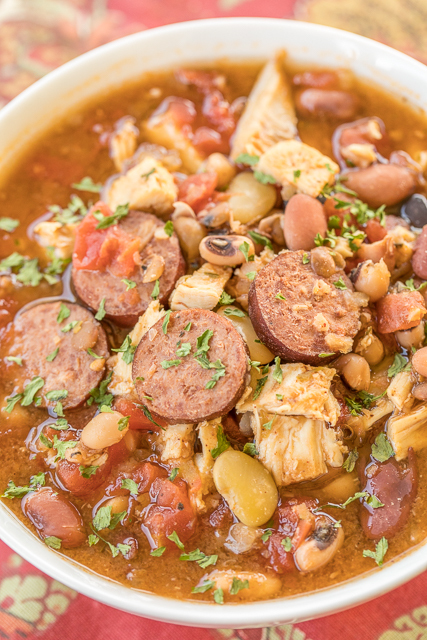 Smoked sausage, roasted turkey, 16 bean soup mix, tomatoes and seasonings. All you need is some cornbread and you have an easy weeknight meal. Freeze leftover for a quick meal later!! Great way to use up leftover holiday turkey! My slow cooker in in overdrive this time of year. I especially love making soup in my slow cooker!! 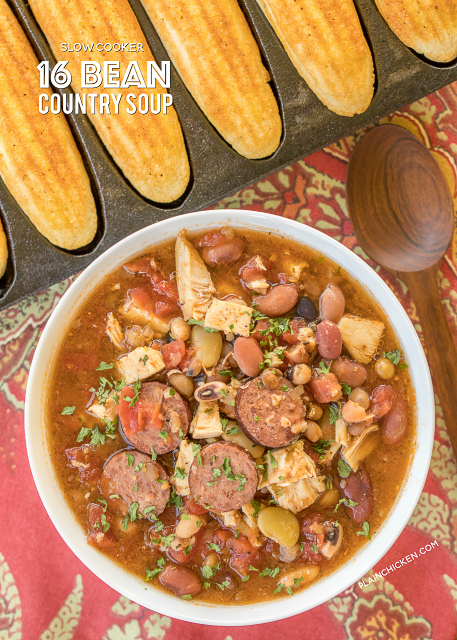 This Slow Cooker 16 Bean Country Soup was crazy good! 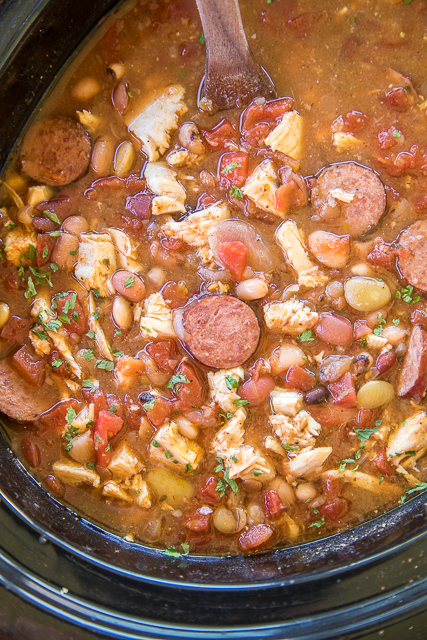 Smoked sausage, roasted turkey (or chicken), tomatoes, beef broth and lots of yummy seasonings. All you need is some cornbread and you have a super easy weeknight dinner!! I used a bag of 16 Bean Soup Starter from Target. It is with all the other dried beans. It had a little bit of everything in the bag - lima beans, black eyed peas, pinto beans, butter beans, black beans. Pretty much any bean you know is in this bag. I used smoked turkey sausage and some chopped up turkey in this soup. This would be GREAT for using up some of your leftover turkey you might have after Thursday's holiday meal. If you don't have any roasted turkey on hand, just toss in some cooked chicken or double up on the smoked sausage. 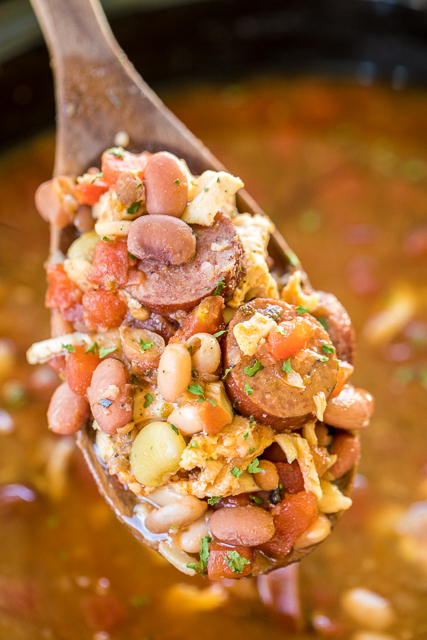 This Slow Cooker 16 Bean Country Soup will taste great with whatever meats you choose to use! This makes A LOT of soup. I took the leftovers and portioned it out into plastic containers and froze it for a quick meal later. Life is pretty hectic this time of year. I always welcome a quick and easy home cooked meal! Combine all ingredients in slow cooker. Cover and cook on LOW 6 to 8 hours. Great looking soup Steph. I have a package of the beans I need to cook. Looks easy and delicious! Will be looking for that soup mix on the next trip to Tar-jay! Do you use the seasoning pack that comes with the beans? I did not use the seasoning packet. Did you pre-soak the beans first (as directed on the package)?